The Hovind Delusion – Illustrated! 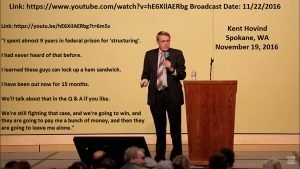 11/19/2016 – Kent Hovind v. Robert Baty – The Great Debates! “I spent almost 9 years in federal prison for ‘structuring’. I learned these guys can lock up a ham sandwich. I have been out now for 15 months. We’ll talk about that during Q & A if you like.